While Champagne Cup may have been touted as the least competitive and most laidback of the major fantasy tournaments of the summer, the eight-team event still provided plenty of exciting matches and a chance for players from the tri-state area and beyond to show off their skills. With short rosters and the injury list growing throughout the day, bracket play became not only a test of skill, but a fight for survival. And, in the end, it was Michael Parada and Phoenix Army that came out on top, outlasting Leopard Army in the finals, 80*-10. Leopard Army, who throughout the day proved to be the most consistent and talented team in the tournament, limped into the finals a shell of its former self. The team started the tournament shorthanded, and things went from bad to worse when Rochester chaser Lisle Coleman reinjured her knee in the team’s second game, leaving them with just five quaffle players total to play four positions, including University of Ottawa’s Adam Robillard, who was serving as the team’s on-pitch seeker. While they were given permission to add former Tufts captain Howie Levine after his Rat Army was eliminated in the quarterfinals, it only did so much to help. Phoenix army, with a larger squad, came in fresher and grabbed control of the finals early by taking and retaining bludger control thanks to their two male beater sets of future NYDC captain Robby May, University of Maryland’s Ben Tunick, and Hofstra’s Mike Iadevaia. Leopard responded by slowing the pace of the game to a crawl, hoping to capitalize on a ruling that the snitch would be on-pitch immediately after the 10 minutes seeker floor ended. Ethan Sturm scored to give Leopard an early lead, and the team then settled in defensively, knowing it had four goals to give. Devin Sandon’s ability to chase down and force turnovers on errant shots and long passes reduced Phoenix’s opportunities, and while Parada managed to snipe a couple of goals, the seekers were released with the score still at 30-10 in favor of Phoenix. Both seekers had their chances early, but the beater play was strong enough to contain them. Perhaps most notable was a kick beat from May on Robillard from a good 15 feet away as Robillard was sneaking up on an unaware snitch. Disaster soon struck for Leopard, as a hard-but-legal charge on an unaware Heather Knoch forced her out for the rest of the game with an arm injury. On top of that, with Robillard seeking, there were some quickly tiring legs on the Leopard chaser line. Phoenix finally broke through for the clinching quaffle points using a quick-moving passing game, before a snitch grab put away the tournament, 80*-10. The finals matchup came as little surprise – Leopard and Phoenix were two of the most dominant teams on the day. Leopard was the tournament’s most physical squad, with Rochester’s Devin Sandon, Robillard and Sturm hitting people early and often. Their offense was just as impressive, with the passing game of Sandon and Sturm accompanied by the driving offense of Robillard and keepers Toby March and Junghune Nam. Backing all of this was the always impressive Heather Knoch at beater, who worked well with Vassar’s Aidan Wilcox, perhaps one of the students of the Peter Lee School of Beating. Phoenix, meanwhile, was very much the Parada show. Backed by perhaps the tournament’s strongest and deepest beater game, including May, Tunick, Iadevaia, Amanda Dallas and Amanda Salvucci, he was able to take over game both offensively, scoring most of the team’s points, and in the snitch game, making most of their grabs. His Penn State teammate, Nick Romano, did much of the rest of the scoring, either off of passes from Parada or through his own drives. While both Leopard and Phoenix met or even exceeded expectations throughout the day, other favorites faltered. Dragon army was a defensive force, led by Alex Leitch of Hostra and elite point defender Jason Rosenberg of Penn State, as well as fresh face Andrew Hollenbach of RIT, and was perhaps the biggest favorite, but struggled to put enough point on the board and needed snitch pulls to win all three of their pool play games. This finally caught up to them in the semifinals, when, playing against a previously 0-3 Tiger Army side, they couldn’t control the bludger game due to the impressive play of heavily underrated NYU beater Kyle Jeon and fell on a snitch grab, 100*-50. Jeon had to leave following the game, and he may have taken Tiger’s hopes with him, as they fell into a 40-0 hole in the semifinals against Phoenix. They worked their way back into it, only to fall to a Parada snitch grab, 70*-20. In the other pool, Griffin Army, led by Dan Hanson, who instilled a strategic, pass-happy offense that looked much like one from his home region, seemed to be living up to expectations early, beating Rat Army 160*-50 and taking a 70-40 lead on Leopard. But Leopard closed the gap before the snitch returned, and it took Robillard less than 30 seconds to grab a game-winning snitch for a 90*-70 victory. Griffin followed that up by dropping a second straight game to Salamander, 70*-50, before being blown out by a Phoenix team firing on all cylinders in the quarterfinals, 100*-20. Throughout the day, the defining difference between the haves and the have nots was seeker play. Robillard was a perfect 5-for-5 on the day leading up to the finals for Leopard, including two game-deciding grabs. 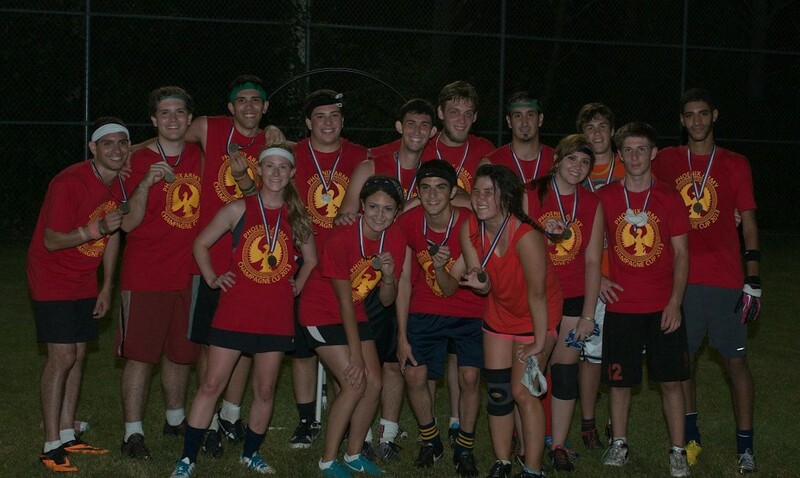 Phoenix seekers, led by Parada, also caught snitched in 5-of-6 games, including a vital one in the semifinals. Griffin, meanwhile, was knocked out with an ugly 0-for-2 SWIM, while Tiger had an arguably worse 1-for-5 SWIM. The surprise team of the tournament, even if they only managed a semifinal appearance, was Salamander Army. The team had no true stars, but was capable of keeping games close, largely due to the hard work of beaters Aaron Roth and Lisa Nitzsche, and then steal them thanks to the play of University of Rochester seeker Justin Keiber-King, who seems ready to step up for his school team in the coming season after a 3-for-3 SWIM performance. Unfortunately, they didn’t have the talent to compete with the roster of Leopard, who easily defeated them twice, including a 120*-10 drubbing in the semifinals in which they could rarely advance the ball past midpitch. As mentioned above, Parada was the heart and soul of the tournament winning team. In one pool play match, he scored all but one of the team’s goals before catching the snitch as well. His defense continues to improve with time, as he has become a much more adept tackler. On the attack, his passing and long shots remain inch perfect, while he still possesses the strength to drive when the opportunity allows. Though his team dominated at Canada Fantasy, Lafrance’s performance was, in a word, underwhelming. He came out slow and out of shape, and bordered on a liability defensively. But he proved he’s still very much a game-changing player this weekend, stepping up again on the defensive end with some bone-rattling tackles from his rugby background while continuing to be productive with his offensive passing game. He also on occasion brought back his “hero ball” driving attack that served him well earlier in his career. As he prepares to captain his Northeast Fantasy team, he’ll hope to keep his momentum going. Dragon Army’s march to a perfect 3-0 record in pool play was in large part thanks to the performance of their star beater. Almost always working with beater partners of less experience, he was still able to shine, while at the same time helping his teammates get the most out of their abilities. His arm remains his greatest asset, but his decision making continues to improve, keeping him out of potentially dangerous situations he may have previously ended up in. Though he struggled in the quarterfinals against Tiger Army and Kyle Jeon, his full day’s work earns him a mention. More or less out of the sport from a competitive standpoint for almost a year, there were definite questions about whether Knoch could return to the game-changing beater she once was. She definitely answered her critics throughout the day, and proved she was still up to the task. Her forceful beats were still there, and though it took her a game to get into the strategic swing of things, once she was there, you rarely saw LeopardAarmy without bludger control. An injury to Knoch in the finals undoubtedly swung things, as Phoenix was struggling to find holes in the defense she was sitting at the heart of. I mentioned that the Dragon Army offense struggled, but when it was generating points, Hollenbach was often heavily involved. He has been touted quietly by RIT as their best player, and proved it all weekend with his physical play and eye for the hoops. While his passing game could still use some work, there is no reason he should remain unknown across the region any longer. How Sandon continues to be overlooked as a truly elite player in the sport is beyond me. There is barely an aspect of his game that can be seen as a weakness; he is an excellent tackler, a capable driver, and at Champagne proved his strength as an off-ball cutter as well. Beyond his technical skills, it’s his never-ending drive that stands out. In the finals, it was Sandon that chased down missed shot after missed shot, denying Phoenix second chances despite being so exhausted that he threw up during a stoppage of play without ever coming out of the game. Playing almost every minute of bracket play for his team, Sandon proved once again just how dangerous of an asset he is. It’s hard not to respect Justin Keiber-King’s perfect 3-for-3 SWIM number, but in watching them both, Robillard undoubtedly impressed more. Once a secret known only to the Canadian teams and those who watched him play in London, Robillard is really beginning to make a name for himself his summer. Robillard has the physicality and the speed to match up well against any style of seeker. Almost every grab he made this weekend took less than a minute, including key game-deciders in pool play and the quarterfinals. While he came up short in the finals, it may have been largely because he also was a physical presence as a chaser, both on offense and defense, for large minutes as well.